The Western Union Company (NYSE:WU), a leader in global payment services and new Global Partner of the UEFA Europa League , today announce the signing of one of the hottest strikers in world football, Atlético de Madrid and Colombian international striker, Radamel Falcao. Falcao will become a global ambassador for Western Union’s PASS initiative, which is turning every successful pass in this season’s UEFA Europa League into funding to support one day’s education for young people around the world. “I was intrigued by Western Union’s PASS initiative and immediately felt a connection,” said Falcao, who has twice won the UEFA Europa League with Porto and Atlético de Madrid, scoring a record 17 goals last season in the competition and is currently providing firepower for Columbia’s push to qualify for the 2014 FIFA World Cup. 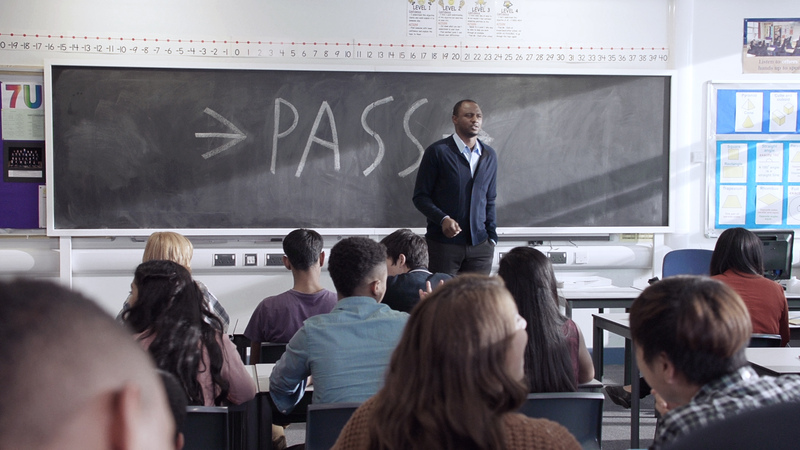 The PASS initiative will provide teacher training and student scholarships through nonprofit, nongovernmental organizations (NGOs), with an initial focus on eleven countries – Brazil, China, Colombia, Jamaica, Mexico, Morocco, Nigeria, Senegal, Romania, Russia and Turkey. 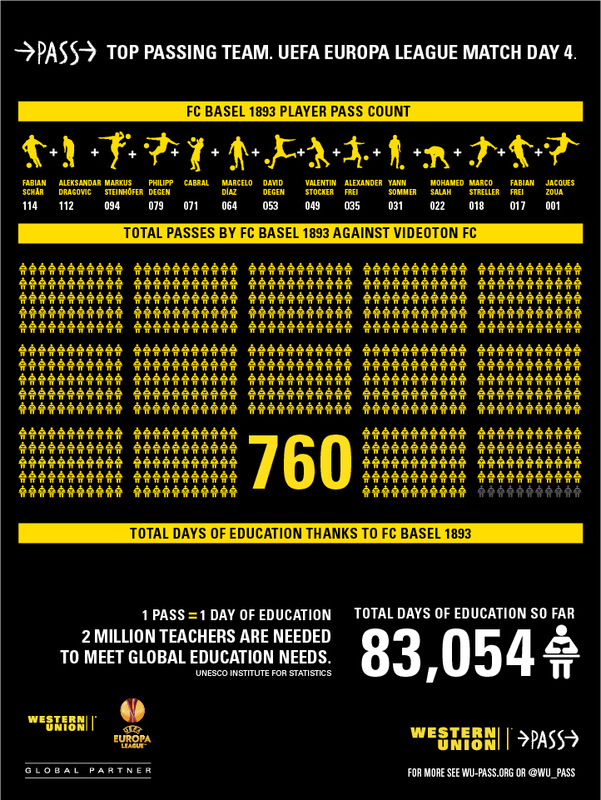 To date there have been a total of 83,054 successfully completed passes in this season’s competition, meaning 83,054 days of education have been provided. 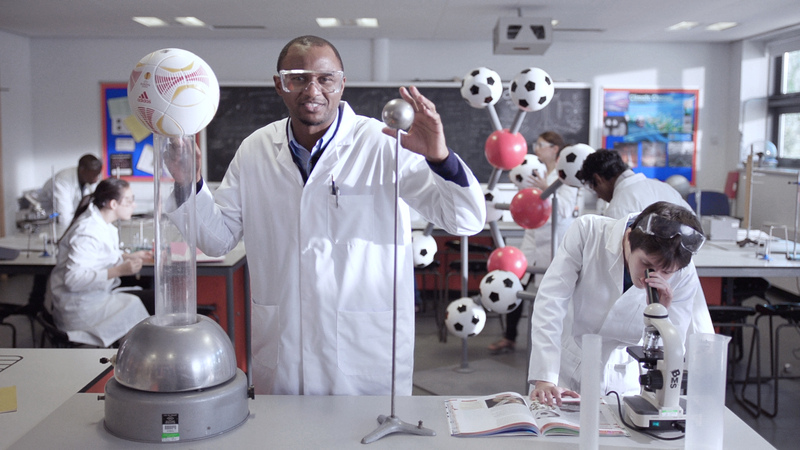 Falcao joins former international football star, Patrick Vieira, as an ambassador to support the PASS Initiative. Both have originated from countries outside of Europe before making their names on the world stage. 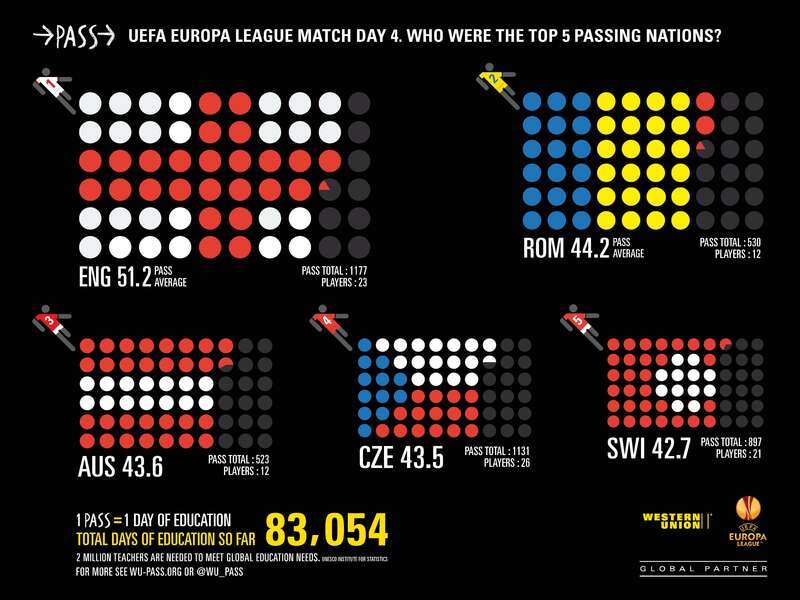 For more information on the Western Union PASS initiative, and for up to date passing stats on each team and individual in the UEFA Europa League, please visit,www.wu-pass.org. Posted on November 14, 2012, in News and tagged atlético de madrid, europa league, Falcao, infographic, PASS, passing, soccer, student scholarships, UEFA, Viera, western union. Bookmark the permalink. Leave a comment.